Enroll in the HPAO- For Attending Students Only! These students were selected and trained to represent our office to current and prospective health professions students. Having recently received his 5th acceptance into dental school, he plans to attend Columbia University College of Dental Medicine. Having recently received her second acceptance, she plans to attend Wash U's Program in Physical Therapy. Having recently received his 6th acceptance into medical school, he will most likely attend Emory University School of Medicine. Having recently received his second acceptance, he plans to attend UMMC's Program in Physical Therapy. Khalid Manzoul and Sherman Jones, Pre-Med Students, attend a Star Wars themed Engineering Formal. APPLY FOR HPAO SCHOLARSHIP HERE! 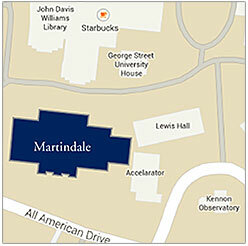 Martindale is located between All American Drive and J.D. Williams Library. Copyright ©2019 Health Professions Advising Office (HPAO) All Rights Reserved.